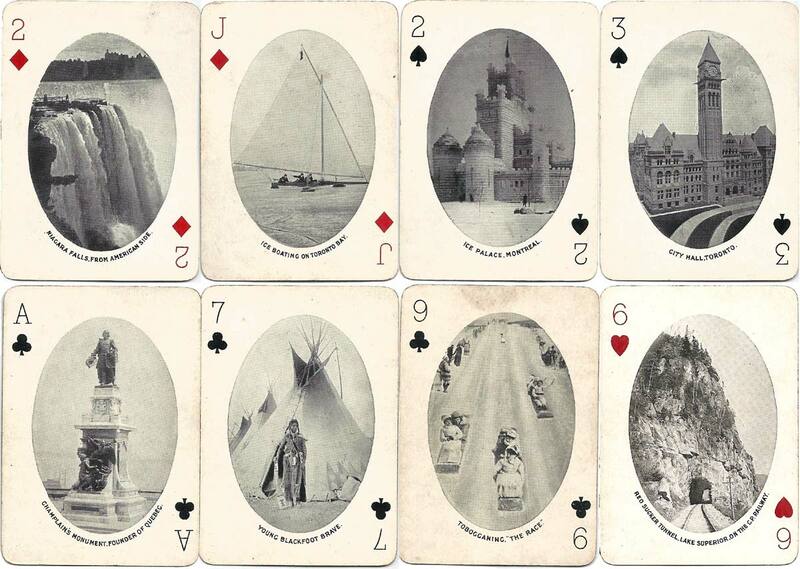 Ocean to Ocean Canadian pictorial souvenir playing cards showing a different photographic view on each card, manufactured by Chas Goodall & Son Ltd, c.1912. Goodall & Son made photographic souvenir decks for the Canadian market since the late 19th century, and this one was issued to commemorate the accession of George V to the throne in 1911. The reverse shows a portrait of King George V with eleven crests of the Canadian provinces and territories, which are also featured on the joker. Above: “Ocean to Ocean” Canadian Pictorial Souvenir playing cards by Chas Goodall & Son Ltd, c.1912. All images courtesy Richard Green.